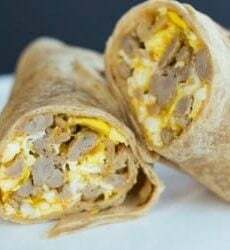 Use your homemade flour tortillas to make these easy breakfast burritos - the filling options are endless! In a large skillet over medium-high heat, brown the sausage, crumbling it as it cooks until it is cooked through. Use a slotted spoon to remove to a paper towel-lined plate to drain. Reduce the heat to medium-low. Add the eggs, season with salt and pepper to taste, and use a rubber spatula to stir until mostly cooked through and clumping, about 3 to 5 minutes. Remove from the heat and add the sausage and shredded cheddar to the pan and stir to combine. Divide the filling evenly between the flour tortillas, fold the sides in and roll up tightly. Serve immediately. To Freeze: Wrap the burritos tightly in plastic wrap and place in a ziplock freezer bag. Freeze for up to 2 months. To reheat, microwave for 1 to 2 minutes, or until heated through.